At Trevi, traditional homemade Italian cuisine is the specialty and the Linguine al Frutti Di Mare is a signature dish not to be missed. Pastas, veal and brick-oven pizza will delight you. 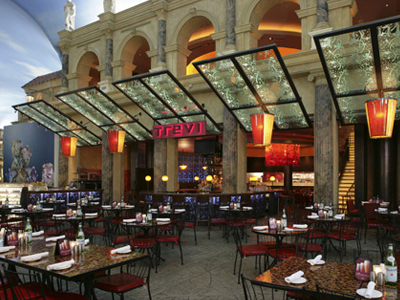 Trevi Time (Happy Hour) is Sunday – Friday 2 pm – 6 pm. Be transported to the streets of Rome when seated on the patio cafe surrounding the “Fountain of the Gods,” or for a quieter, more modern experience choose the dining room inside. Traditional homemade Italian cuisine is the specialty and the Linguine al Frutti Di Mare is a signature dish not to be missed. Pastas, veal and brick-oven pizza will delight you. Both charming and whimsical, Trevi will fill you with a warm glow of satisfaction. The gelato bar offers a rainbow of flavors to finish your meal. If you can’t get to Rome, go to Trevi! Trevi now offers a variety of gluten-free, vegan and vegetarian menu items. Additional Information: Trevi Time (Happy Hour) Sunday – Friday 2pm – 6 pm, specially priced drinks and appetizers in bar area. The 2-course lunch menu offers soup or salad to start and a pasta/pizza choice for your second course. Where you sit depends on what type of experience you want. Sit near the fountain of the gods and there is lots of people watching under the blue sky. The fountain produces a lot of background noise though. Inside is more romantic and quiet. I loved the linguine and clam sauce and my husband loved the lasagna. Our waiter was great! Service was excellent! The warm bread is AMAZING! Our waitress recommended the eggplant crisps appetizer and it was delicious! Also great location inside Caesars Palace! Ordered Lasagna and Chicken Caesar Salad.. Great Choice!. Eat with “Fountain of the Gods” the view is beautiful. Service is great and after dinner they take your picture with the fountain. Great place to eat if you have the money. Have the Fritto Misto! Its Delish!! !